The attack on figure-skater, Nancy Kerrigan, just before the 1994 Winter Olympics, is one of those moments that has permeated pop-culture. It has been referenced and parodied so many times that there are few who are not familiar with the story, so I won’t bore you regurgitating it here. Suffice to say that it led to the downfall of her team-mate, Tonya Harding, whose ex-husband was found to have planned the whole thing. This is essentially a biopic of Harding, but hung on the infamous incident. Shot in a mockumentary style, we see Harding (Robbie) and ex-husband, Jeff Gillooly (Stan) giving wildly differing accounts of their life and relationship – and, of course, of the build up to the attack. The fact is both parties have always told very differing stories, so the mockumentary style takes advantage of this, allowing the audience to hear all sides of the tale without interrupting the flow of the movie. In footage from the era, and in subsequent interviews, Harding came across as hard-nosed and unlikeable. However, Robbie instils her with a sympathy. There is no denying that she had a difficult childhood, and you do get more of an understanding of her actions from this. Robbie is not afraid to be ugly when necessary either, and at times, she is reminiscent of Bette Davis’ legendary Baby Jane character. The Harding portrayed here comes across as a very determined and ambitious woman, who refuses to let her modest beginnings get in the way of her sporting success. Unfortunately, she faces an uphill struggle to be accepted, because of her somewhat trashy image. It doesn’t help that she has a chip on her shoulder the size of Texas either. 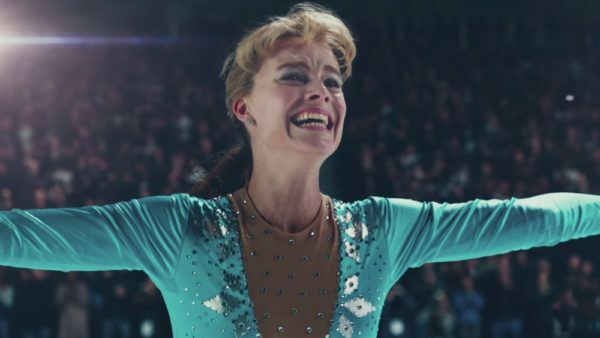 Robbie first appears on-screen playing Tonya when she is supposed to be a teenager, and this does jar somewhat, as she looks far too old. However, this is not the first biopic to bring in their star somewhat too early to be credible. This aside, Robbie owns this movie, and is rightly deserving of all the awards-buzz she is receiving. Janney plays a blinder as Harding’s mother. She is brilliantly funny as the pushy mum, but you are never quite sure if she likes her offspring that much. Again, both the real-life Harding and her mother give contradicting stories about her childhood, and that is again reflected here. Stan is also fantastic as Gillooly. He bounces well off Robbie, and manages to make the character somewhat sympathetic, despite his less than pleasant traits. With its tongue very much in its cheek, Gillespie knows that everyone is waiting for the actual attack, and he has some fun with it before giving us the details. At the time, it seemed far more brutal than the way it is portrayed here, and it would be interesting to get Kerrigan’s thoughts on the portrayal of the life-changing event. As a viewer though, the irreverence with which it is treated almost makes it more palatable, and almost cartoonish. This is deliciously dark, and hugely aided by the fact that the real-life protagonists are all larger than life. Wickedly funny and deeply moving, you will find yourself rethinking Harding and her legacy. It could be argued that it perhaps should have been more reverent, given the ripple-effect that its central event had on so many lives and careers. However, with such varying accounts, and so much finger-pointing from all involved, it would probably prove impossible to get to the true facts, so all things considered, this has been handled very well. If you didn’t know this was based on a true story, you would marvel at the imagination of the writer, Steven Rogers. The fact that it is essentially a biopic only goes to show how much stranger than fiction truth really is.